Monark has since a long time been associated with safety and quality. With this in mind we created Monark Ergomedic 874E. A new weight ergometer with a softer design, and enforced frame. New instrumentation to measure heart rate by using a chest belt, speed, pedal revolutions, distance, time, calorie consumptions and power in watts. Order your Monark 874E Weight Ergometer Bike from FitnessZone.com today! To achieve new heights in exercise biking safety and quality for a high-intensity commercial audience, the Monark 874E Weight Ergometer was designed with a more stable, reinforced frame, and fully enclosed flywheel. The Monark 874E is a perfect bike for basic fitness testing, helping it meet the rigorous demands and needs of sports medicine clinics, universities, professional sports teams, and testing facilities. Monark created the 874E with safety and quality in mind, outfitting with a softer design than other fitness bikes. 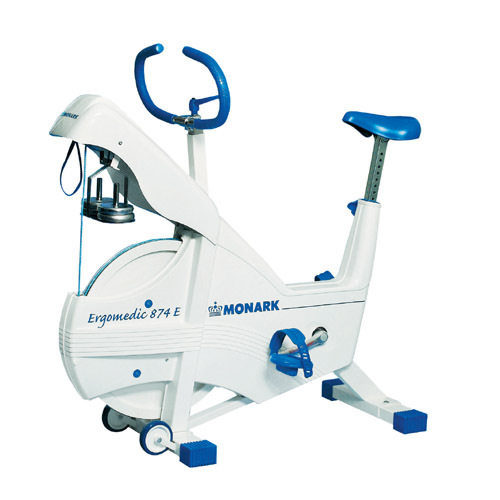 The Monark 874E Weight Ergometer boasts a patented, self-regulating brake system that requires no calibration. Heart rate is monitored via telemetry-based chest belt, while electronic meter readings track speed, RPM, distance, time, watts, calories burned and power in watts. Reproducible work loads are enabled by mechanical sliding belt tension. Seat and handlebar heights can be adjusted to suit the needs of various body types or position preferences. Other details include an adjustable seat post, a chest belt, PC software for analysis, a solid steel tube frame, an adjustable handlebar, bottom wheels for easy transport, and a maximum weight capacity of 275 pounds. Still left in the new bike is the traditional and safe measurement system with improved mechanics. The Monark 874E Weight Ergometer measures 21 by 44 by 44 inches (W x H x L) and weighs 127 pounds. Call 1-800-875-9145 with any questions you may have. Go to FitnessZone.com to order your Monark 874E Weight Ergometer Bike. Order your Monark 874E Weight Ergometer Bike from FitnessZone.com today!